When we traveled to Portugal last year, we ate so much good food. One of the dishes was a vegetable risotto the restaurant was able to make vegan-friendly by omitting the cheese and butter. Perhaps a cardinal sin in making risotto, but they obliged. One bite in and recipe inspiration was born. 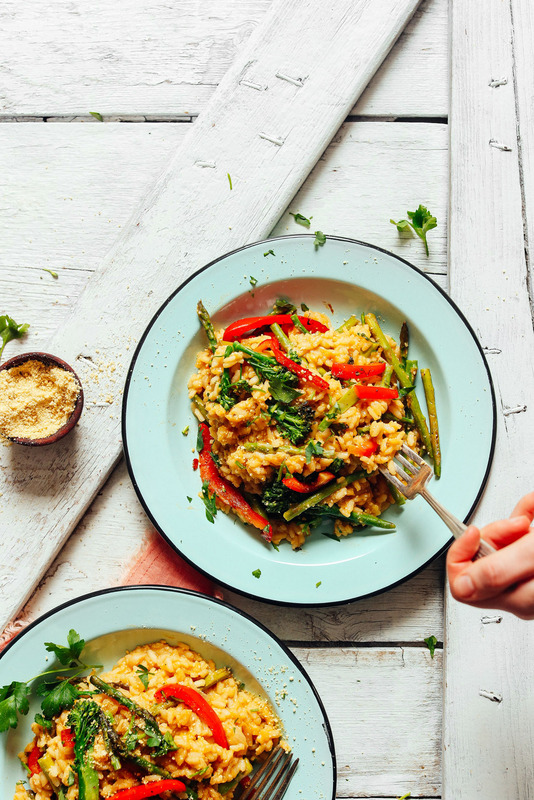 This vegan, gluten-free, oil-free risotto is made with 8 ingredients in 30 minutes from start to finish! It starts with fresh vegetables sautéed until just tender. We went with bell pepper, broccolini, and asparagus, but go with whatever is available and in season for you. Next, start cooking the risotto by sautéing shallot and then adding arborio rice and white wine for flavor. 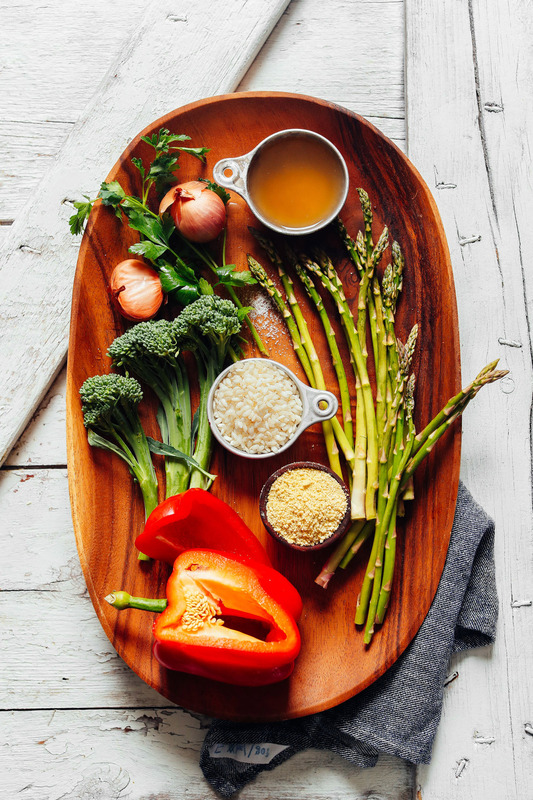 Once the wine cooks down, add warmed vegetable broth one ladle at a time and stir as it cooks until “al dente.” Then just add your vegan parmesan cheese and the sautéed vegetables and you’re good to go! It’s that easy. Always use warmed vegetable broth so it doesn’t halt the cooking when added to the rice. Stir frequently as the rice cooks to prevent sticking. Cook the rice at a simmer instead of a boil so the rice can cook slowly and evenly. Cook until just “al dente” to avoid gummy risotto. This would make the perfect weeknight meal when you need something that’s incredibly satisfying and comforting in a hurry. It would make a delicious entrée or side dish, and it would also work well for dinner parties, as it’s a versatile side dish that complements just about any main. If you’re into rice dishes, also be sure to check out our Vegan Fried Rice, Mushroom & Leek Risotto, 30-Minute Cauliflower “Rice” Stir Fry, Cheesy Cauliflower Rice & Broccoli Bake, and Veggie Brown Rice Sushi. 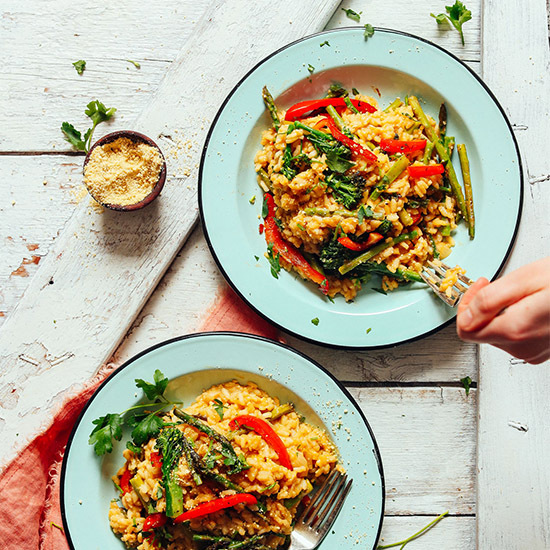 A healthier take on risotto without oil or butter, replacing cheese with vegan parmesan cheese. Includes plenty of fresh vegetables for fiber and nutrients. An easy 30-minute, 8-ingredient recipe perfect as an entrée or a side. Once the rice is cooked through and al dente, remove from heat and season with salt and pepper to taste. Also add vegan parmesan cheese and most of the cooked vegetables, reserving a few for serving. Stir to coat (see photo). Best when fresh, though leftovers will keep covered in the refrigerator for 2-3 days. We haven't tried freezing this recipe. *Nutrition information is a rough estimate calculated with water (not oil). I have made this twice and it is delicious! Much easier to prepare than I anticipated. I made this a recipe a couple time already. And it has been a winner for my family. Thank you so much! This was my first attempt at risotto & was a family favorite! I subbed green beans for asparagus. Also I have tried a number of veggie broth options- my favorite is the Orrington Farms Vegan Broth base where you mix 2 tsp powder for each cup of water- it is favorful like chicken broth, but plant based. I also recommend using more than 4c broth for a creamy version! I made this following the directions to the letter and it was absolutely perfect! My vegetarian daughter loved it, as did the carnivores in my family. For non-vegan vegetarians, I also made a batch throwing in 2 tablespoons of cream at the end, and using real Parmesan cheese. That was also delicious!! Loved it!! Delicious! My husband, who is vegetarian, and I (who is not) both really enjoyed this dish. I added spinach to the vegetable mix, as I had a tub that needed to get eaten, in addition to the asparagus and peppers. The asparagus gave it a nice fresh crunch (and I love asparagus! ), and the spinach added some extra green veges to the recipe, which is much appreciated after the decadence of Christmas! I used regular Parmesan, as neither of us are vegan, and it was delicious! Simple to make and a tasty change from pasta or other rice dishes (I’m not a very good vegetarian cook – I find it quite challenging). Thanks for the recipe! My husband and I are both under 21 and unable to purchase wine, is there any substitute you would recommend? I know it gives a unique flavor, Thanks in advance! Hi Molly! I’d recommend just subbing with more vegetable broth! My first time making a risotto and first time using one of your recipes, and it turned out amazing! I added mushrooms as well to increase veggie intake and they went perfectly well with the recipe. Thank you so much for this! I have saved the recipe and will definitely be making it again. Hi, question: was this risotto paired with anything else? If you were to pair it with something else what would you suggest? I made this with quinoa instead at it turned out beautifully! Delicious!! Oh my goodness. I have tried MANY Minimalist Baker recipes, but THIS was something special! Love love love! Delicious! I used asparagus, red pepper, and mushroom as well as Parmesan cheese, and was able to make a spectacular dish by sticking to the exact instructions. Thank you – this will be going into my recipe book! It’s correct, but feel free to reduce if you’d like! This dish is soooo good! It’s creamy, hearty and satisfying. It’s easy, yet you feel accomplished when done making it! Thank you thank you! Looks delish. Any suggestions for adding more protein to this recipe? Thanks! You could add some tofu, perhaps? Check out our crispy tofu recipe here! Just made this recipe for the first time tonight and my omnivore family LOVED it! I used a homegrown red onion instead of a shallot and it came out incredible. Definitely going to make this again!! I added zucchini in place of broccolini but still included red pepper and asparagus. I didn’t have shallot and so used red onion. This recipe is delish. Thanks so much! I have just made this for dinner tonight and it received rave reviews from my boys. I added more vegetable using both asparagus and broccolini and included mushrooms and garlic. Super easy I’ll be making this again. Thanks!! This was a delicious, simple recipe. My only suggestion is to make a little more than the recipe calls for – I would say the “4” servings is more like 3 if this is your main course. Making this tonight! But in my non-vegan way I’m making it with real parm, mostly because I’m too lazy to make the substitute! Love your recipes!!! I’m a PA, and I’ve been giving all of my patients your blog to inspire them to eat healthier! Real parm will work, Allison! We hope you enjoy it! The rice was hard to cook. Had to use extra broth. Otherwise very good. I just finished eating this and had to comment how great it was! I made the vegan parmesan with almonds as I was out of cashews. It turned out perfect and added such great flavour to the risotto. My non-vegan husband loved it too! Definitely making this one again. Yay! Glad to hear it, Kathy! Perfect! 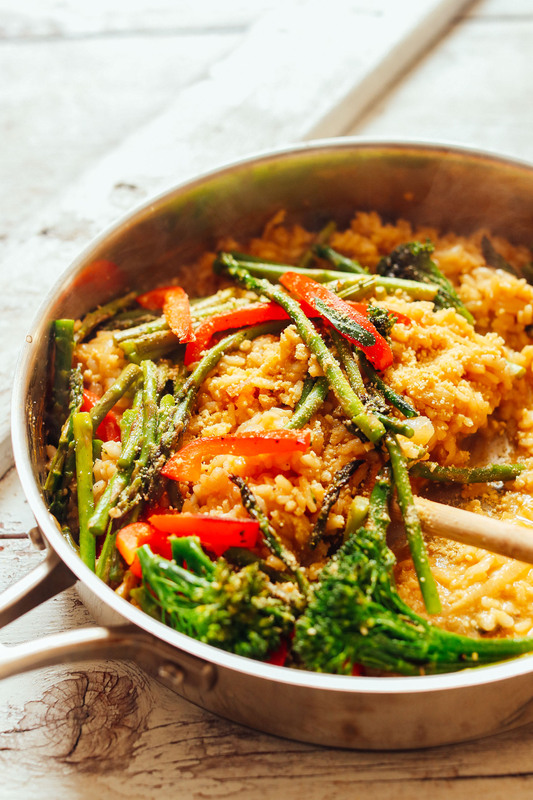 The creaminess of the risotto is contrasted perfectly with the freshness of the veggies. I cooked the risotto first and then just kept it covered while I sautéed the veggies. Served there risotto, topped with the veg, and then squeezed some fresh lemon juice on top. So delish! You are the very best! I Always know that I can go to you to just solve my meal! I love your minimalist recipies good job ! So kind! We are glad to hear you are finding our recipes helpful, Javier! Risotto is one of my favorite foods ever!! This was amazing!!! I added bell pepper, mushrooms and zucchini in mine and my husband and I devoured it! Will be making this again and cannot wait to experiment with other vegetables. I made this last night for dinner using red pepper and asparagus, and it was fabulous. I’ve been fully vegan for a little over a year, but I also took 6 months to completely transition. I would never have made it without your recipes. Thank you so much!! I’m eternally grateful. We’re so glad you’e finding our recipes helpful, Megan! BOMB! It was so delish and easy! I love the fact you can essentially use any veggies on hand, although I loved the pepper and asparagus combo! Definitely adding as one of our weekly meals. Thanx for the recipe. I adapted this into a paella style dish with mushrooms and cannellini beans too, stir fried everything in a paella pan, added the broth all at once, brought it to a boil, then let it sit and simmer for 20 min. No stirring required, and it turned out great! What a great idea, Karen! Thanks for sharing! This was so easy, very delicious and really creamy! It was great reheated the next day, thanks for the great recipe? Yay! We’re glad you enjoyed it, Amy! This was excellent—and easy. Delicious, creamy, mmm. I wasn’t missing the real Parmesan at all in this version. Thanks for a fab recipe! This was absolutely delicious! Loved it, yet another winner. Yay! Glad you enjoyed it, Lee! I’ve made this like 5 times since you posted it. I can’t get enough. So good and so easy. My toddler also gobbles this up. Thanks for the recipe!!! I’ve never made risotto before, but this was easy and delicious! I only had a little bit of shallot on hand so I added some garlic too. I also added the juice of one large lemon and omitted the white wine since I didn’t have any. Thanks for sharing! I have never been disappointed by Minimalist Baker, and this risotto was no exception! Delicious and simple, and as someone else mentioned even kinda fun to cook, which is quite a statement coming from this non-cook! We really appreciate all of your simple and tasty recipes and the tips that you provide to help us out. I made this recipe today and it was delicious! I used both asparagus and broccoli, and Parmesan cheese. I t was great! next time I will add mushrooms. However, the 5 minute prep time was longer than that. I guess I’m not such a quick chopper. There is no way I can chop/slice vegetables that quick, and the cook time was longer too. Overall, probably at least 45 minutes. But definitely worth it! While everyone works at different speeds in the kitchen, we’re glad you enjoyed it, Marisa! This was so great! I used different veggies (red pepper, mushrooms, carrots and green beans) and it was still great. I also just used nutritional yeast and we liked it. Thanks for a great recipe! This recipe is SO good. What a great find. Thanks for sharing this. Also, I subbed vegan parm for nutritional yeast. Worked great. This was my first time trying risotto. I found this rather bland, maybe I should of used more salt & pepper or omitting the white wine is to blame. Love it and so does everyone that has tried this. I sub in sweet onion for shallots. First time I made with broccoli and red pepper, used vegan “not-chicken” bouillon cubes for veg broth. Second time, I made baby bella mushrooms, peas and peppers (the peppers were completely unnecessary), I used vegan “not beef’ bouillon for veg broth. Each was really, really good. Made both oil free. Great recipe and for some reason, it’s fun to cook. Thanks!! I LOVE your recipes! I made this exactly as written, plus mushrooms. I used Pinot Grigio wine. It took me 1/2 hour to cook the rice, but I think my time is based on what I consider simmer. This risotto is soooooo delicious! Thank you! I just finished cooking this and my non-vegan SO said it is the best thing I’ve ever cooked. Thank you!!!! Will definitely be using this recipe many more times :) Way more successful than the last time I tried to cook risotto! My first risotto attempt, and I was not disappointed – tasty, flavour-packed dish! Mine was not as creamy as pictured even with 4 cups broth, so may use a little more next time. Still an absolutely delicious meal! SOOO delicious!! I made it last night and I couldn’t get enough of it! The vegetable broth and wine made it so yummy (but not gummy, like you warned!). Thanks again for a delicious recipe, you’re my favorite cook!! This was amazing! I made it for Easter and the non vegans couldn’t believe it was vegan :) I am making it again tonight (3 days later) but using different veggies. This is now going to be one of my go to recipes, thank you Dana!! Oh yay! Thanks for sharing!! I have never made risotto before, and this was way easier than I expected! I am not vegan so I substituted vegetable broth for chicken broth and the vegan Parmesan for actual cheese. Delicious! I made this tonight and it was amazing! Rice was the perfect texture and the asparagus and peppers were crisp tender. Such a savory cheesy flavor and not a drop of oil! Made tonight and the family loved it. Definitely will make again thank you! I made this yesterday and it was the best thing ever! So simple, easy, and delicious! We’re glad you enjoyed it, Bella! DELICIOUS! I’m an avid Minimalist Baker fan, and THIS is definitely one of the best recipes I’ve ever made. Just finished devouring it seconds ago. I used homemade veggie broth (your recipe) and it came out perfectly tender, and so flavorful! It was easy and quick. Definitely making this again. Made this exactly as directed and it was delicious! We will be adding this to the regular dinner rotation for sure. I cook only plant-based meals for my family of 5, and it’s hard to satisfy everyone and still serve a variety of meal choices throughout the week. Thanks for this fabulous addition!! I love your site. It’s become a go-to for quick, delicious plant-based meals that everyone in my family will eat. Very good adaptation of traditional risotto, If I can add something, for who is up to using olive oil/vegan butter, the ‘soffritto’ with shallots (or onions) super finely chopped at the beginning + olive oil and / or vegan butter is one of the most important thing in making a real risotto. Also leave it rest (italian ‘mantecare’) for some minutes at the end, covered after having added some olive oil/vegan butter. How romantic! Can you customize the vegetables in this recipe? I would love to try everything out with mushrooms, spinach, and even peas! Peas and Mushrooms are wonderful in this recipe: The second time I made this dish, I used baby Bella mushrooms, peas and yellow/orange pepper. The pepper was not needed and the peas and ‘shrooms worked REALLY well. I don’t like veg broth (even homemade), so I use Vegan bouillon (Not Beed Cubes for the Mushroom and Pea version) and it was amazing. I made a large batch and took some to my neighbors and they loved it as well! Oh, and I sub in sweet onion for shallot. I live in a rural area and shallots can be hard to find. Delicious! Thanks so much. Love your recipes! Very good. I’ve had this now both as the directions specify, and with basmati rice because I was in a pinch. To the basmati rice version I also added cauliflower, browned a bit. Great recipe. I will certainly return to it frequently. Smart! Thanks for sharing, Steve! As a former Natural foods chef I’ve made a version of this using short grain brown rice and it works wonderfully. Nuttier. Not a fan of Arborio because it lacks nutrients. Try it sometime and bravo on your continued success! Okay… here you are…AGAIN…. I always know your recipes will be healthy, easy to make and delicious. I can count on it. Thank you… I just prepared food for 13 people for 4 days… a lot I was able to do ahead and freeze. Many recipes I got right here. THANK YOU SO MUCH!! This recipe came out really good. Cold and rainy day here so perfect for tonight’s dinner. I used red onion instead of shallots and probably added too many asparagus (they are so good right now!) but everyone in the family liked it even though they have been ambivalent about risotto in the past. Thank you for a great recipe. I made this recipe with already cooked brown rice, just had to simmer a little while longer while adding more vegetable broth to get the desired consistency. DELICIOUS! Thank you for this amazing risotto recipe! Made this for dinner and it came out perfectly !! I served it with homemade garlic bread, some of Ikea’s veggie balls and tomato sauce and it was the tastiest meal I’ve had in a while !! Can I use brown rice or jasmine rice for this recipe? Will it make a difference in the taste? 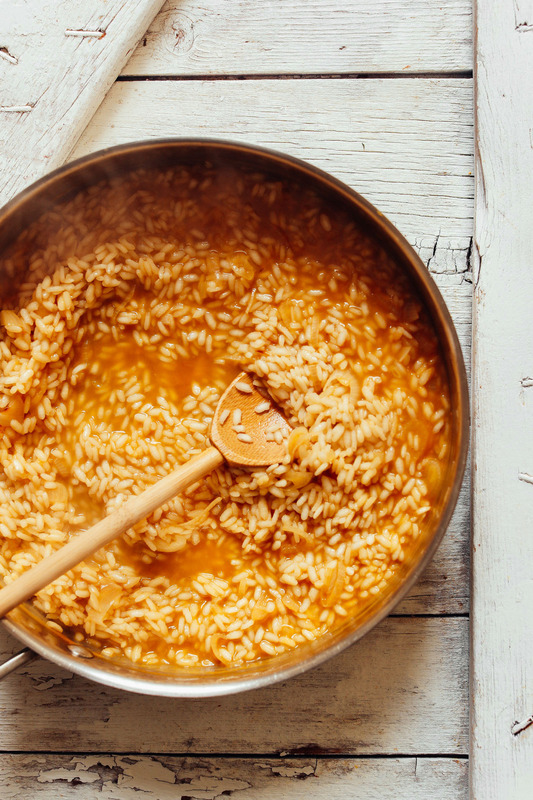 Arborio rice is used specifically for risotto for best texture. But if you try another rice let us know how it goes! It was delicious! Thanks for another wonderful oil-free recipe Dana! Hi Mitch! The vegan parmesan is homemade (recipe linked above) so it’s not “fake” cheese. But if you’d rather, you can totally omit and just use nutritional yeast instead. I used Parmesan cheese and it was absolutely delicious! If you can eat cheese, of course. 3/4 cup of shallots?? That sounds like a lot! Dana, this recipe makes my heart happy. The past couple months I have had some really great risottos in restaraunts and was saddened at the complexity of the dish and that I could not make it at home. I cannot wait to try this! I have a question regarding the oil/water for sauteeing the vegetables/shallot. Which do you prefer? Will using one over the other alter the creamy yumminess of the risotto? I think oil can make it a little creamier, but it’s not a huge difference. xo! Your email with this recipe came at the perfect time! I’m excited to try this out tonight! Thank you! Well unfortunately i was out of arborio rice, so i cooked up a Costco quinoa/rice blend with veggie broth, and then cooked the veggies (dubbing more broccoli and some peas for the red peppers), as per the recipe, following all the other instructions for the vegan parm, etc. It was a hit!! I can’t wait to try it with the proper rice next time. Thanks for the great recipe!! Can you replace vegan cheese with nutritional yeast? The vegan cheese that she links to is her recipe for vegan parm, it’s just cashews and nutritional yeast with garlic powder and salt. Going to make this for lunch tomorrow, I think. It will be made all the simpler by using my Instant Pot! No standing by stirring constantly. Comes out perfectly every time. Yum!! This looks amazing! 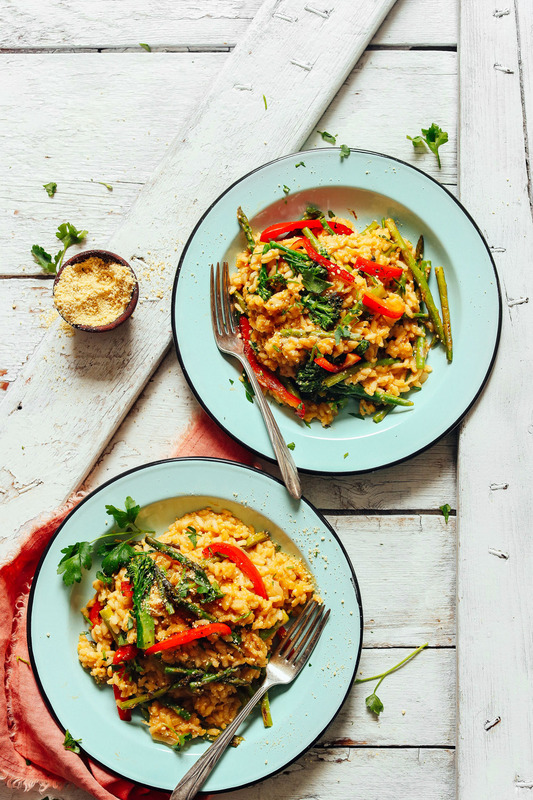 Can’t say I have ever had vegan risotto, but if it’s one of your recipes, I have got to try it!! Arborio rice is the classic rice for risotto because it is starchier than other rice and creates the creamy texture of the dish. If you use already cooked brown rice your dish would not be risotto and would not taste the same as this recipe. You’d essentially just have rice and vegetables, which is good, but not risotto. This isn’t true. Risotto is a process. The rice you mentioned are great types of rice for getting results you want with these measurements.